What does it take to get a man out of his clogs after 30 years? A pair of Michelin shoes. 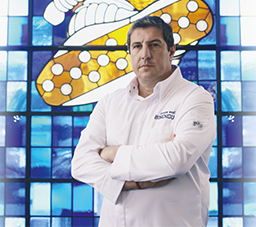 We talked to two-star chef Claude Bosi about courage and team spirit, about Bibendum and Michelin, about magic, colour and light - and of course, about the shoes. 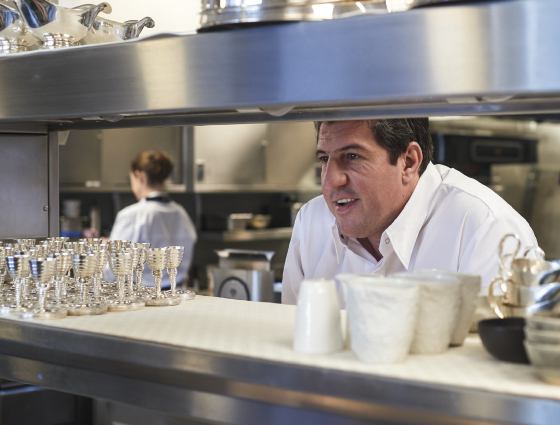 Claude Bosi's life and Michelin are inextricably linked. Being French, naturally he grew up with this tyre specialist, map maker and culinary expert. But it is not until he chose a career in the kitchen, first in France and later in England, that the link became fully transparent, with Michelin stars around every corner. His two Hibiscus restaurants in England both earned two stars in no time and, since 2016, he's been running Bibendum**, which now also boasts two stars. The restaurant is named after the famous Michelin man. Where is it located? As can only be expected, in the former Michelin headquarters in London, England. Bosi explains, “The building is a magical place. The moment I walk into the restaurant, I feel at home." It was built in 1911 and has an iconic look & feel, thanks to the Art Deco and Art Nouveau style of the design. It has served as an office, a storage warehouse for more than 30,000 tyres and a garage where you could have your tyres switched. Today, there is an oysters bar on the ground floor and a restaurant that serves lunch and dinner on the second floor. The building has three enormous stained glass windows with the Michelin man in them. "The colours in the restaurant change by the hour, with sunlight entering the building from three different sides. The ambiance never ceases to enchant me." As a tyre specialist, Michelin knows all there is to know about road surfaces. They are now using that knowledge to develop shoe soles for outdoor sports. So, it was an obvious decision for Chaud Devant to contact Michelin to develop a shoe for kitchen use. It's a match made in heaven since, after all, Michelin has been part of the world of chefs and great food for centuries. The result? The GT1pro Magister, also referred to as the "Michelin shoe". It's available in a tall and low model and in brown or black. And psssst...there is also a special edition in red - made exclusively for three-star chefs. 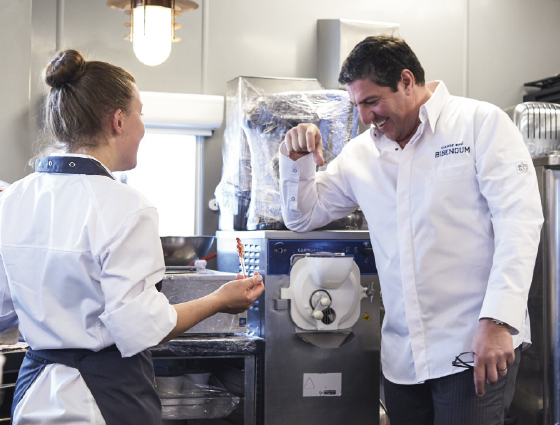 Who other than Claude Bosi to be our ambassador for the Michelin shoes? When we talk to him, the first thing we want to know is how he's faring with the shoes. "They're extremely comfortable. You may find it hard to imagine, but I've spent the last 30 years wearing traditional French clogs - sturdy, black, plastic shoes made especially for chefs. It would never enter my mind to get rid of them since they fit perfectly. But the timing was brilliant because the sole had started to crack and I needed new ones. At that same exact time, I was contacted about the Michelin shoes. I never expected this comfort because I was always a bit afraid that regular shoes would be too flat. But the fit is fantastic. They are absolutely a cut about all other chefwear I've seen so far. The height of the shoe is perfect and the sole provides excellent support. The quality is fantastic. I wear them every day." To which he adds, “I'm not saying this because I'm the ambassador. Or because I love Michelin. I'm saying this as a chef, as a human being who spends his days pursuing the highest possible quality."